Note: If you are looking for information on the cathedral of Salzburg, please read our article on the Salzburger Dom. 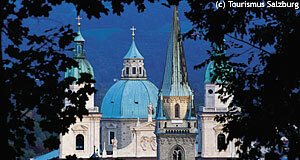 This article is on the cupola of the cathedral only, the Salzburg Dome. The term "Salzburg Dome" is often used for the mighty cupola of the cathedral. Like the rest of the building, it is an exceptionally fine example of early Baroque architecture. The Salzburg Dome is 71 metres high and the centrepiece of the building. Looking up into the Salzburg Dome from the ground floor, you will note two rows of eight frescoes each. Both of them depict scenes from the Old Testament. Just like the frescoes of the main nave, they are thought to be made by the Italian painters Donato Mascagni and Ignazio Solari. The frescoes of the Salzburg Dome relate to the scenes from the Passion of Christ in the main nave. Looking at the segment surfaces at the corners, you will see frescoes that depict the four evangelists. Above these frescoes, you will see the coats of arms of the Prince Archbishops Paris Lodron and Andreas Rohracher. These are the two Salzburg bishops that opened the cathedral, the former after its construction in the mid-17th century, the latter after the renovation and repair work following WWII was completed in the mid-20th century. Speaking of the Second World War: With the devastating economic situation just after 1945 and the severe damages that bombs had caused on the cathedral, the repair work had to be done very quickly and with very basic means. Therefore, the Salzburg Dome was built in haste, the builders in charge lacked the expertise of their 17th century colleagues. As a result, the Salzburg Dome is not perfectly symmetric. This is hard to notice from most spots, but quite obvious if you look at it from the Capuchin Monastery (Kapuzinerkloster): You will see that the Salzburg Dome leans slightly towards one direction.